L-ascorbic acid (vitamin C) is a major antioxidant in plants and plays a significant role in mitigation of excessive cellular reactive oxygen species activities caused by number of abiotic stresses. Plant ascorbate levels change differentially in response to varying environmental stress conditions, depending on the degree of stress and species sensitivity. Successful modulation of ascorbate biosynthesis through genetic manipulation of genes involved in biosynthesis, catabolism and recycling of ascorbate has been achieved. Recently, role of ascorbate in alleviating number of abiotic stresses has been highlighted in crop plants. In this article, we discuss the current understanding of ascorbate biosynthesis and its antioxidant role in order to increase our comprehension of how ascorbate helps plants to counteract or cope with various abiotic stresses. Adverse environmental factors such as excessive cold, heat, drought and salinity stresses result in a considerable yield loss of crop plants all over the world. These abiotic stresses elicit complex cellular responses in the plant system, resulting in the production of excessive reactive oxygen species (ROS) such as hydrogen peroxide (H2O2), hydroxyperoxyl (HO2·), superoxide (O2-) and singlet oxygen (1O2) radicals. Excessive ROS generated in plant cells tends to interact with different macromolecules resulting in oxidation of proteins, membrane lipids and nucleic acids and causes cellular damage, ultimately affecting the growth and productivity of plants (Wang et al. 2003). To protect themselves from adverse conditions, plants have evolved a number of cellular defense mechanisms including antioxidants such as ascorbate, glutathione and tocopherols as well as ROS-detoxifying enzymes such as superoxide dismutases, peroxidases and catalases (Inzé and Van Montagu 1995; Noctor and Foyer 1998). Among the plant antioxidants, L-ascorbate is a major antioxidant playing a vital role in the mitigation of excessive ROS activity through enzymatic as well as non-enzymatic detoxification (Mittler 2002). It also acts as a cell signaling modulator in numerous cellular processes including cell division, cell expansion and cell wall growth (Liso et al. 1984; Conklin and Barth 2004; Wolucka et al. 2005; Zhang et al. 2007). It is a cofactor for the number of enzymes such as violaxanthin de-epoxidase (VDE, xanthophyll cycle), 1-aminocyclopropane-1-carboxylic acid (ACC) oxidase (ethylene biosynthesis) and 2-oxoacid-dependent dioxygenases (ABA and GA biosynthesis) (Eskling et al. 1997; Davey et al. 2000; Smirnoff 2000). 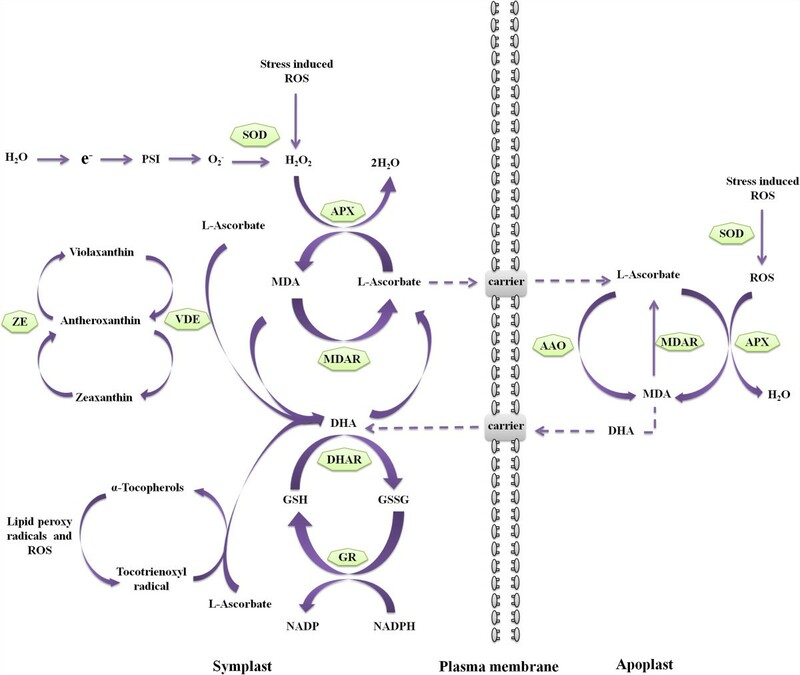 Plants with low ascorbate biosynthesis are rather sensitive to various environmental stress conditions affecting their growth and development (Müller-Moulé et al. 2004; Huang et al. 2005; Alhagdow et al. 2007; Gao and Zhang 2008). Recently, it has been reported that ascorbate plays a crucial role in protection against various environmental stresses such as, drought (Hemavathi et al. 2011; Fotopoulos et al. 2008), salinity (Kwon et al. 2003; Huang et al. 2005; Wang et al. 2005; Sun et al. 2010a; Zhang et al. 2011; Venkatesh et al. 2012), ozone (Zheng et al. 2000; Sanmartin et al. 2003; Feng et al. 2010), low/high temperatures (Kwon et al. 2003; Larkindale et al. 2005) and high light intensity (Müller-Moulé et al. 2004; Talla et al. 2011). These studies on mutant and/or transgenic plants (summarized in the Table 1) with altered endogenous ASA levels proved that ascorbate plays a significant role in plant growth and development as well as abiotic stress tolerance. In this article, an attempt has been made to illustrate the role of ascorbate in various abiotic stresses in crop plants by exploring transgenic technology. APx-R, APX-related; CAPOA1, Capsicum annuum ascorbate peroxidase-like 1 gene; MV, methyl viologen; NPR, net photosynthetic rate; PEG, polyethylene glycol; RNAi, RNA interference; VIGS, Virus-induced gene silencing; VVMEE, Viral-vector-mediated ectopic- expression. In plants, the accumulation or steady level of ascorbate is maintained in homeostasis through the rate of synthesis, recycling and degradation, as well as intra- and inter-cellular transport (Horemans et al. 2000a; Pallanca and Smirnoff 2000; Green and Fry 2005). Characterization of low ascorbate producing mutants (vtc) of Arabidopsis has helped us to better understand the essential role of enzymes involved in the biosynthesis of L-ascorbate (Conklin et al. 1996; Conklin et al. 2000; Huang et al. 2005; Conklin et al. 2006; Müller-Moulé 2008). Now it is well known that in higher plants, ascorbate biosynthesis occurs through well-characterized D-mannose/L-galactose pathway (Smirnoff-Wheeler pathway), where D-mannose is converted to L-galactose via GDP-sugar intermediates (Wheeler et al. 1998) (Figure 1). L-galactose is further oxidized to L-galactono-1,4-lactone, which is converted into ascorbate, by L-galactono-1,4-lactone dehydrogenase (L-GalLDH), located on the inner mitochondrial membrane (Siendones et al. 1999; Smirnoff 2001). All of the genes that are involved in this pathway have been well-characterized; these include genes encoding GDP-D-mannose pyrophosphorylase (Conklin et al. 1999), GDP-D-mannose-3’,5’-epimerase (Wolucka and Van Montagu 2003; Watanabe et al. 2006), GDP-L-galactose phosphorylase (L-galactose guanylyltransferase) (Dowdle et al. 2007; Linster and Clarke 2008), L-galactose-1-phosphate phosphatase (Laing et al. 2004a), L-galactose dehydrogenase (Gatzek et al. 2002; Laing et al. 2004b) and L-GalLDH (Imai et al. 1998; Siendones et al. 1999; do Nascimento et al. 2005; Tokunaga et al. 2005; Alhagdow et al. 2007). L-ascorbic acid biosynthesis pathways in plants (modified after Hemavathi et al. 2010 ): (1) Smirnoff-Wheeler pathway, (2) L-gulose pathway, (3) Myoinositol-based pathway, (4) D-galacturonic acid pathway. In addition to the Smirnoff-Wheeler pathway, three other potential pathways of ascorbate biosynthesis have been identified in plants. It was demonstrated that in addition to production of GDP-L-galactose, GDP-D-mannose-3’,5’-epimerase can also produce GDP-L-gulose (Davey et al. 1999; Wolucka and Van Montagu 2003). Moreover, exogenous L-gulose and L-gulono-1,4-lactone were shown to serve as direct precursors of ascorbate in Arabidopsis cell cultures (Davey et al. 1999). These observations led to a proposal for an alternative L-gulose pathway in which L-gulose and L-gulono-1,4-lactone are important intermediates (Wolucka and Van Montagu 2003). However, the intermediate steps in this pathway have not yet been characterized in plants. 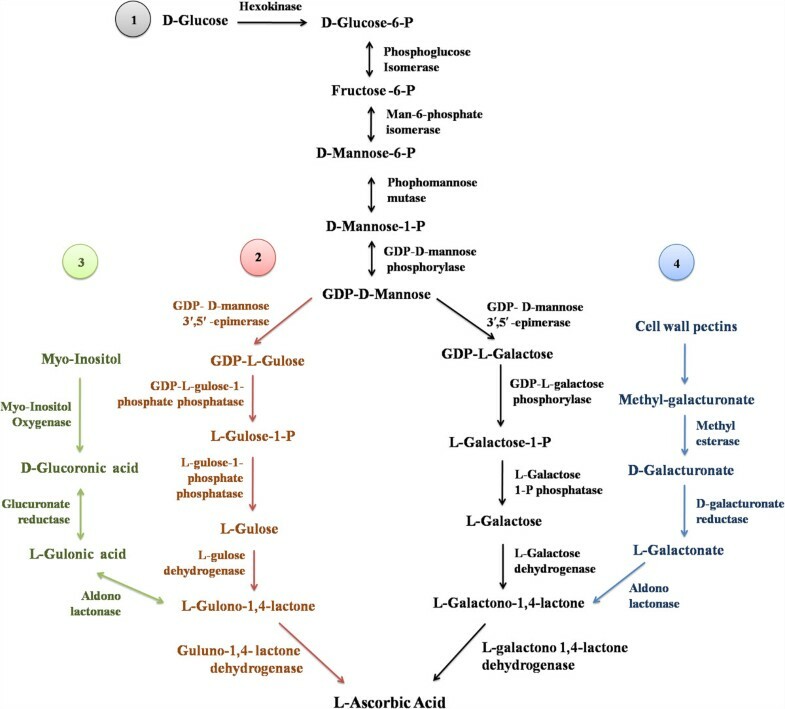 D-galacturonic acid pathway involves the conversion of D-galacturonic acid, a product of the degradation of cell wall pectins to L-ascorbate via L-galactono-1,4-lactone (Agius et al. 2003; Cruz-Rus et al. 2011; Badejo et al. 2012) (Figure 1). Following the cloning of Arabidopsis myoinositol oxygenase (MIOX) gene by Lorence et al. (2004), a myoinositol-based pathway (animal-like pathway) was proposed (Figure 1). MIOX converts myoinositol to D-glucuronate and plants can catalyze the conversion of D-glucuronate into L-gulonic acid. However, recently, Endres and Tenhaken (2009), proved that the MIOX is involved mainly in the modulation of the metabolite level of myoinositol and plays a negligible role in the plant ascorbate biosynthesis. Once the ascorbate is synthesized on the inner mitochondrial membrane, it is transported to different cellular compartments including the apoplast. Both the ascorbate and DHA transport is mainly mediated by facilitated diffusion or active transport systems (Ishikawa et al. 2006). In contrast to ascorbate, DHA tends to be more efficiently transported across plant membranes with a higher affinity and capacity (Horemans et al. 1998; Szarka et al. 2004). It was proposed that specific plasma membrane transporters transport ASA or DHA in plants (Horemans et al. 2000b). However, either the protein or the gene associated with this transport and the nature of the mechanisms driving these carrier proteins are still inconclusive. Several other putative ascorbate transporters are associated with the plant plasma membrane (reviewed in Horemans et al. 2000a); however, the specific mechanisms by which they transport ASA or DHA have not been well elucidated. Ascorbate biosynthesis occurs in almost all plant cells and tissues. However, its level is generally high in photosynthetic tissues, meristematic tissues, flowers, young fruits, root tips, and apices of stolons or tubers (Gest et al. 2013). In certain fruits, such as Ribes nigrum (by galactose pathway, Hancock et al. 2007) and strawberry (by D-galacturonic acid pathway, Agius et al. 2003), increased accumulation of ascorbate occurs by a combination of long-distance transport and in situ biosynthesis. High ascorbate demand in developing sink tissues is probably because it is critical for cell cycle and cell division/growth, which cannot be met entirely by sink tissue alone (Smirnoff 2000; Franceschi and Tarlyn 2002). Ascorbate accumulation in sink tissue is controlled to some extent by ascorbate biosynthesis in source tissues (Franceschi and Tarlyn 2002; Tedone et al. 2004). Franceschi and Tarlyn (2002), demonstrated that the long-distance transport of ASA in plants occurs via phloem, where L-ascorbate was found to be loaded into the phloem of source leaves and transported to sink tissues. In addition, ascorbate biosynthesis, which occurs in phloem tissue via the D-Man/L-Gal pathway could also contribute to ASA accumulation in plant storage organs (Hancock et al. 2003). In mammals, sodium-dependent ascorbate transporters (SVCT1 and SVCT2), which belong to the nucleobase-ascorbate transporter (NAT) family, have been identified and well characterized as an active ascorbate transport system (Daruwala et al. 1999; Tsukaguchi et al. 1999; Ishikawa et al. 2006). Although numerous NATs have been identified in plants (Li and Schultes 2002; Maurino et al. 2006), their role in ASA transportation has not been established. Further studies are required to determine the definitive role in plant ascorbate transportation. ASA pool in cells is maintained through synthesis, recycling and transportation, and plays an important role in adaptation of plant to various stresses (Stevens et al. 2008). Ascorbate takes part in several enzymatic and non-enzymatic mechanisms for elimination of deleterious ROS (Asada and Takahashi 1987), and as a result, MDHA and DHA accumulates in the cells. The two enzymes involved in the oxidation of ascorbate are ascorbate oxidase (AAO) and ascorbate peroxidase (APX). AAO is an apoplastic enzyme that catalyzes the oxidation of ASA to MDHA using oxygen and is associated with cell wall metabolism and cell expansion (Smirnoff 1996). Ascorbate peroxidase (APX) is a class I peroxidase catalyzes the conversion of H2O2 into H2O, using ascorbate as a specific electron donor, thus resulting in the accumulation of MDHA as a by-product (Teixeira et al. 2004). The ASA pool size is dependent, on both the rate of synthesis and the rate of reduction of MDHA and DHA back to ascorbate. MDHA and DHA produced as a result of activities of APX and AAO, respectively, should be efficiently recycled to maintain the reduced pool of ASA. MDHA is reduced back to ASA by MDAR using NADH/NADPH as electron donors. In addition, plant PM cyt b 561 (plasma membrane b-type cytochrome c) is also associated with the recycling of ASA from MDHA on the cytoplasmic side of the plasma membrane (Trost et al. 2000; Asard et al. 2001; Pignocchi and Foyer 2003). DHA is reduced to ASA by dehydroascorbate reductase (DHAR) using reduced glutathione (GSH) as an electron donor or by the electron-transport chain (ETC.) electron carriers (Szarka et al. 2007). Thus, DHAR and MDAR are crucial components in the maintenance of the reduced pool of ASA and are of prime importance in oxidative stress tolerance (Eltayeb et al. 2006). Although the pathway of ascorbate synthesis is distributed between the cytosol and the mitochondrion (Foyer 2004; Smirnoff et al. 2004), the ascorbate degradation pathway appears to reside in the apoplast (Green and Fry 2005). In most plants, ascorbate degradation can occur via dehydroascorbate, yielding oxalate (OxA) and L-threonate (ThrO). However, in some plants (Vitaceae eg. grape), ascorbate can also be degraded via L-idonate to L-threarate (L-tartrate) (Green and Fry 2005). A degradation pathway for ASA/DHA catabolism in plants has been reported recently (Simpson and Ortwerth 2000; Parsons and Fry 2012). Ascorbate degradation pathway involves enzymic and/or non-enzymic oxidation to dehydroascorbic acid (DHA), which may irreversibly hydrolyze to 2,3-diketogulonate (DKG). However, many of the enzymes involved in the degradation pathway of ASA are not well characterized in plants. Both DHA and DKG prone to further oxidation under the same physiological conditions as that of apoplast (Parsons and Fry 2012). DHA can be oxidized by H2O2 non-enzymatically to a monoanion (cyclic-oxalyl-threonate; cOxT) and a dianion (oxalyl-threonate [OxT] isomers, 3-OxT and 4-OxT) independently through formation of a reactive intermediate cyclic-2,3-O-oxalyl-L-threonolactone (Parsons et al. 2011). In the absence of H2O2, DKG is relatively stable, however slowly generates a range of products, such as 2-carboxy-l-xylonolactone, 2-carboxy-l-lyxonolactone and 2-carboxy-l-threo-pentonate (Parsons et al. 2011). In the presence of apoplastic plant esterases or prolonged non-enzymatic incubations, substantial hydrolysis of cOxT to OxT and then OxT to OxA and ThrO would take place (Parsons et al. 2011). Genetic modulation of plant ascorbate pathway has become feasible with advancements made in plant genomics and genetic engineering. Several possible strategies have been followed to increase ascorbate production in plants via genetic engineering of enzymes involved in the biosynthesis and recycling of ascorbate. Several transgenes, which are of plant and animal origins, have been successfully used for increasing biosynthesis of ascorbic acid. Mouse L-gulono-c-lactone oxidase (GLOase) gene in tobacco, lettuce and potato (Jain and Nessler 2000; Hemavathi et al. 2010), human dehydroascorbate (DHAR) gene in tobacco (Kwon et al. 2003), wheat DHAR gene in tobacco and maize (Chen et al. 2003; Naqvi et al. 2009), Arabidopsis MDAR gene (AtMDAR1) in tobacco, strawberry D-galacturonic acid reductase (GalUR) gene in Arabidopsis and potato (Agius et al. 2003; Hemavathi et al. 2009) and rice L-GalLDH gene in rice (Liu et al. 2011) have been successfully cloned and expressed (summarized in the Table 2). MV, methyl viologen; NPR, net photosynthetic rate; RNAi, RNA interference. A high concentration of ascorbate in chloroplasts would imply its central role in photosynthesis (Smirnoff 1996). Ascorbate plays a crucial roles in scavenging the deleterious ROS that are generated as by-products of photosynthesis and as a key component in excess photonic energy dissipation mechanisms, such as the water-water cycle (WWC) (Neubauer and Yamamoto 1992; Asada 1999) and the xanthophyll cycle (Müller-Moulé et al. 2002; Yabuta et al. 2007). WWC, which is also known as Mehler peroxidase reaction, is one of the most important detoxification systems functioning in intact chloroplasts (Asada 19941999,2006). It involves the photoreduction of O2 by PSI to a superoxide radical, followed by the dismutation of superoxide radical by superoxide dismutase (SOD) to hydrogen peroxide and oxygen (Müller-Moulé et al. 2002). The hydrogen peroxide is reduced to water by ascorbate, catalyzed by ascorbate peroxidase (APX), and the resulting by-product monodehydroascorbate (MDA) is directly reduced to ascorbate either by reduced ferredoxin of PSI (Miyake and Asada 1992; Miyake and Asada 1994; Asada 1999) or by NAD(P)H-dependent chloroplastic MDHA reductase using NADH or NADPH as electron donor (Sano et al. 2005). MDHA can spontaneously disproportionate to ascorbate and dehydroascorbate (DHA) (Asada 1999). DHA is unstable at the physiological pH and irreversibly degrade to 2,3 diketo-1-gulonic acid if not recycled back to ascorbate. To preserve the ascorbate pool, DHA should be rapidly reduced back to ascorbate. DHA is recycled back to ascorbate via the ascorbate-glutathione cycle by reduced glutathione (GSH), catalyzed by DHAR (Shimaoka et al. 2003). Finally, glutathione reductase (GR) converts glutathione disulfide (GSSG) back into GSH using NAD(P)H as a reducing agent (Figure 2). Recently, Huang et al. (2008), reported that thioredoxin h2 (Trx h 2) having both DHA reductase (in the presence of glutathione) and MDA reductase (in the presence of NADH) activity may also involve in the regeneration of ascorbate from DHA and MDHA, respectively. Multiple functions of L-ascorbate in plants. During abiotic stress conditions, scavenging of ROS by APX increases MDA content in both apoplast and symplast. If the MDA is not rapidly reduced back to ascorbate by MDAR, spontaneously disproportionate into ascorbate and DHA. Cytoplasmic DHAR can reduce DHA back to ascorbate using GSH, and the resulting GSSG is regenerated back to GSH through the action of GR in a NADPH dependent reaction. Furthermore, during oxidative stress conditions, L-ascorbate acts as a cofactor for violaxanthin de-epoxidase for the formation of zeaxanthin and also involves in the regeneration of α-tocopherol from tocotrienoxyl radicals. Increased biosynthesis of ascorbate in high light exposed plants and enhanced photoinhibition and oxidative damage in ascorbate-deficient plants would imply its role in excess light energy dissipation (Smirnoff 2000; Müller-Moulé et al. 2004; Yabuta et al. 2007). It was previously reported that high light stress results in the induction of the cytosolic APX and protects the cytosol and other cellular compartments from high light induced oxidative stress (Mittler 2002; Mullineaux and Karpinski 2002). Several isoforms of APX have been found in many plant species including both monocots and dicots, and are localized to various subcellular compartments. In Arabidopsis, nine APX genes were described (Panchuk et al. 2002; Mittler et al. 2004; Narendra et al. 2006; Koussevitzky et al. 2008): two cytosolic, two microsomal, three chloroplastic, one mitochondrial, and one dual-targeted to mitochondria and chloroplasts (Chew et al. 2003). In tomato, APX gene family comprises of seven genes encoding three cytosolic, two peroxisomal, and two chloroplastic APXs (Najami et al. 2008). Whereas, in rice, the APX gene family consists of eight genes encoding two cytosolic, two peroxisomal, and three chloroplastic isoforms and one is targeted to the mitochondria (Teixeira et al. 2004,2006; Hong et al. 2007). Recently, Lazzarotto et al. (2011), characterized a new class of rice putative heme peroxidases, APX-R (APX-related), a dually localized protein, targeted to both chloroplasts and mitochondria, which is functionally associated with APX. APX genes have been partially characterized in some plant species such as spinach (Ishikawa et al. 1995,1996,1998), cowpea (D’Arcy-Lameta et al. 2006) and eggplant (Lin et al. 2007). The large functional diversity and subcellular localization of the APX genes suggest the degree of complementation and coordination of the antioxidant defences in different cellular compartments during development and abiotic stress (Teixeira et al. 2004,2006). APX is highly responsive to various abiotic stresses and plays an important role in the scavenging of ROS in plants. Mutant studies in Arabidopsis revealed that cytosolic APXs (APX1 and APX2) are critical for cellular H2O2 homeostasis and play an important role in growth, development and oxidative protection of chloroplasts under various abiotic stresses (Pnueli et al. 2003; Davletova et al. 2005; Koussevitzky et al. 2008; Zhang et al. 2013). In particular, Arabidopsis APX1 is important for plant growth and development (Pnueli et al. 2003), whereas APX2 is critical for drought tolerance (Rossel et al. 2006). Thylakoid-bound APXs (tAPXs) are crucial for photosynthesis and photoprotection under photo-oxidative stress in Arabidopsis (Kangasjarvi et al. 2008). In rice, expressions of OsAPX genes are modulated by various abiotic stresses and exogenous ABA as well as by biotic stresses (Agrawal et al. 2003; Teixeira et al. 2006; Hong et al. 2007; Rosa et al. 2010). The expressions of two cytosolic APX genes, OsAPX1 and OsAPX2, are developmentally regulated (Agrawal et al. 2003) and the suppression of either of these genes resulted in strong effects on plant growth and development and produced semi-dwarf rice phenotypes (Rosa et al. 2010). Zhang et al. (2013), reported similar results wherein, downregulation of OsAPX2 gene affected the growth and development of rice seedlings, resulting in semi-dwarf and lesion-mimic seedlings, yellow-green leaves, and seed sterility. In contrast, the overexpression of OsAPX2 gene increased APX enzyme activity and thus resulted in enhanced stress tolerance. Davletova et al. (2005), demonstrated the role of cytosolic APX1 in cross-compartment protection of thylakoid/stromal and mitochondrial APXs during light stress. Despite the protection of each individual cellular compartment by its own set of ROS-scavenging enzymes, APX1-deficient Arabidopsis plants exhibited the oxidation of chloroplastic, mitochondrial and membrane-bound proteins, suggesting the key role of cytosolic APX1 enzyme in the cross-compartment protection of adjacent compartments (Davletova et al. 2005). However, some early studies certainly suggest that thylakoid membrane-bound APX (tAPX) is a limiting factor of antioxidative systems under photo-oxidative stress in chloroplasts and that the enhanced activity of tAPX under stress is to maintain the redox status of ascorbate (Yabuta et al. 2002). Moreover, transgenic Arabidopsis plants overexpressing Suaeda salsa chloroplastic stromal APX (sAPX) and thylakoid-bound APX (tAPX) also showed an increased tolerance to high light oxidative stress by efficient detoxification of ROS (Pang et al. 2011). Ascorbate also plays a significant role in formation of zeaxanthin during photo-oxidative stress (Figure 2). The excess excitation energy from the incidence of high light is invariably dissipated as heat by zeaxanthin in the light harvesting complex of the photosynthetic apparatus (Demmig-Adams and Adams 1996). Zeaxanthin is regenerated (via Xanthophyll cycle) in the successive de-epoxidation of violaxanthin and antheroxanthin by the enzyme VDE, which is located in the thylakoid lumen, and requires ascorbate as a cofactor (Neubauer and Yamamoto 1993; Müller-Moulé et al. 2002). Müller-Moulé et al. (2003), demonstrated the role of ascorbate in regeneration of zeaxanthin in ascorbate-deficient mutant of Arabidopsis, vtc2. These plants are characterized with an increased degree of lipid peroxidation and photoinhibition, and the regeneration of zeaxanthin from violaxanthin was slower due to insufficient ascorbate content. In the cell, ROS is continuously produced during normal functioning of the photosynthesis, respiration and photorespiration as well as in various enzyme-catalyzed redox reactions (Dat et al. 2000; Moller 2001). However, ROS activity increases several folds under stress conditions and can serve as a signal that activates defense responses by specific signal transduction pathway in which hydrogen peroxide acts as secondary messenger (Helena and de Carvalho 2008). However, an increased ROS activity for the prolonged period can cause oxidative stress in plants. If ROS is not efficiently scavenged and quenched, it can cause membrane lipid peroxidation, inactivation of cellular enzymes and degradation of nucleic acids, which may eventually lead to the death of plant cells. Plants with higher ascorbate content can effectively scavenge the excessive ROS generated during stress conditions, and confer increased tolerance to abiotic stresses. Increased salt stress sensitivity of the Arabidopsis vtc mutant is attributed to the low intrinsic ascorbate levels and impaired ascorbate-glutathione cycle, which resulted in an enhanced ROS activity and a significant decrease in the CO2 assimilatory capacity (Huang et al. 2005). Moreover, deficiency of ascorbate may limit the recycling of α-tocopheroxyl radicals to α-tocopherol, which may, in turn, increase the oxidation of thylakoid membrane lipids under drought conditions (Munné-Bosch and Alegre 2002). Several transgenic plants overproducing ascorbate showed an enhanced salt and drought tolerance with reduced membrane lipid peroxidation and chlorophyll content loss. These plants also exhibited higher survival rate and a significantly higher seed germination rate, fresh weight and root length (Wang et al. 2005; Sun et al. 2010a; Zhang et al. 2011). Transgenic potato plants expressing strawberry GalUR gene and rat GLOase gene with several-fold increased biosynthesis of ascorbate also exhibited a better survival under salinity and drought stresses conditions including a reduction in the level of lipid peroxidation (Hemavathi et al. 2009; Hemavathi et al. 2011; Upadhyaya et al. 2011). Regulation of plant ascorbate redox state by means of synthesis, degradation and transport plays an essential role in plant adaptation to the stress (Stevens et al. 2008; Yin et al. 2010). MDAR and DHAR are key enzymes involved in the regulation of the ascorbate redox state and are of vital importance in the oxidative stress tolerance. MDAR maintains higher redox state of ascorbate by recycling the oxidized MDHA. Several isoforms of MDAR have been found in different cellular compartments, such as chloroplasts (Miyake and Asada 1994; Sano et al. 2005), cytosol and mitochondria (De Leonardis et al. 1995; Jiménez et al. 1997; Mittova et al. 2003), peroxisomes (Mittova et al. 2003; Leterrier et al. 2005) and glyoxysomes (Bowditch and Donaldson 1990), to serve the specific physiological role in each cellular compartment. The level of MDAR expression increases in response to oxidative stress triggered by several stress conditions (Yoon et al. 2004; Leterrier et al. 2005; Kavitha et al. 2010). Transgenic tobacco plants overexpressing a salt-inducible chloroplastic MDAR from halophyte Avicennia marina survived better under conditions of salt stress compared with wild-type plants (Kavitha et al. 2010). Similarly, transgenic potato plants overexpressing the Arabidopsis DHAR gene in the cytosol exhibited enhanced DHAR activity with faster growth, even under drought and salt stress conditions (Eltayeb et al. 2011). High salt and drought tolerances were also observed in transgenic plants overexpressing APX gene. Heterologous expression of OsAPX2 gene improved salt tolerance in transgenic Arabidopsis and alfalfa (Lu et al. 2007; Guan et al. 2012). Increased APX activity was observed in roots of etiolated rice seedlings in response to NaCl stress and was correlated with upregulation of chloroplastic OsAPX8 expression; however, no effect on the expression of the rest of the rice APX isoforms was observed (Hong et al. 2007). In contrast, Teixeira et al. (2006), reported the enhanced expression of OsAPX2 and OsAPX7, and severe downregulation of OsAPX8 in rice seedlings under NaCl stress. This observed discrepancy in the above results seemed to be differ with cultivars, plant age, tissues, and growing conditions (Hong et al. 2007). It has been demonstrated that OsAPX gene expression and H2O2 production were increased in response to NaCl in roots of etiolated rice seedlings (Tsai et al. 2004,2005). However, OsAPX8 expression and APX activity induced by NaCl are not mediated through H2O2 in rice roots (Tsai et al. 2005; Hong et al. 2007). In rice roots, accumulation of ABA in response to NaCl was correlated with upregulation of OsAPX8 expression (Hong et al. 2007). Moreover, exogenous application of ABA also specifically enhanced the expression of OsAPX8. Similarly, application of ABA increased the expression of APX genes in pea, rice, and sweet potato (Mittler and Zilinskas 1992; Agrawal et al. 2003; Park et al. 2004). These findings indicate that NaCl induced expression of APX is mediated through an accumulation of the ABA. Transgenic plants overexpressing a heterologous cytosolic APX gene showed an enhanced tolerance to salt stress with lower ROS activity (Badawi et al. 2004; Wang et al. 2005; Lu et al. 2007; Faize et al. 2011). These transgenic plants exhibited lower electrolyte leakage and lipid peroxidation, higher water use efficiency, minimal leaf damage and better photosynthetic performance. Similar results were obtained in the transgenic tobacco overexpressing Solanum lycopersicum thylakoid-bound APX (tAPX) and showed a better performance in terms of photosynthetic efficiency, root lengths and fresh and dry weights of the plants with enhanced tolerance to salt and osmotic stresses (Sun et al. 2010a). Yamamoto et al. (2005), demonstrated that downregulation of apoplastic AAO (ascorbate oxidase) confers higher salt tolerance in tobacco and Arabidopsis plants. It was suggested that under salt stress conditions, suppressed expression of apoplastic AAO led to a relatively low level of hydrogen peroxide accumulation and a high redox state of symplastic and apoplastic ascorbate, which, in turn, increased the salt tolerance. Interestingly, transgenic tobacco plants with elevated levels of hydrogen peroxide by overexpression of a cell wall-localized cucumber AAO conferred increased drought tolerance due to reduced stomatal conductance (Fotopoulos et al. 2008). Control of the stomatal aperture is essential for the plant adaptation to changes in its ambient environment. Several mechanisms for the regulation of stomatal aperture have been proposed (Kim and Lee 2007; Araújo et al. 2011). It has been found that O2- and other activated oxygen species are involved in the regulation of stomatal movement (Purohit et al. 1994). Zhang et al. (2001), demonstrated that hydrogen peroxide may function as an intermediate in ABA signalling in guard cells. During stress conditions ABA causes an increase in hydrogen peroxide production and induces stomatal closure. Stomatal closure induced by hydrogen peroxide was reversed by exogenous application of ascorbate because of hydrogen peroxide detoxification activity of ascorbate (Zhang et al. 2001). Earlier, Chen and Gallie (2004), demonstrated that transgenic plants with DHAR overexpression exhibited an increase in the ascorbate redox state and reduced levels of hydrogen peroxide in guard cells and leaves showed greater stomatal opening, increased transpiration rate and stomatal conductance even under normal growth conditions. Whereas, plants with suppression of DHAR activity showed an elevated level of hydrogen peroxide and conferred increased drought tolerance with a decreased ascorbate redox state. It has been known that the enzyme AAO, which catalyzes the oxidation of ASA to DHA exclusively located in the apoplast, plays an important role in the maintenance of the redox state of the apoplastic ascorbate levels (Pignocchi and Foyer 2003; Sanmartin et al. 2003; Pignocchi et al. 2006). However, the mechanism of regulation of AAO gene expression and stomatal moments is not clearly understood. It has been suggested that the signal perception of stomatal closure is altered by AAO overexpression (Pignocchi and Foyer 2003; Fotopoulos et al. 2008). Transgenic tobacco leaves overexpressing a cell wall-localized cucumber AAO contained elevated levels of hydrogen peroxide and ABA content, thereby resulting in reduced stomatal conductance and reduced rates of water loss (Fotopoulos et al. 2008). Based on these results, it is predictable that either the suppression of DHAR expression or the overexpression of AAO would result in the decrease in the ascorbate redox state and causes increased accumulation of hydrogen peroxide levels resulting in stomatal closure, lower transpiration thus providing drought tolerance. However, in both, suppression of DHAR expression or overexpression of AAO would result in greater accumulation of apolastic DHA levels which may play a key role in the regulation of stomatal aperture. An increasing concentration of ambient ozone was observed during recent decades in many industrial and rural regions of the world and poses a hazard for vegetation. The ozone exposure of plants causes extensive visible leaf damage and decreased rates of stomatal conductance and photosynthesis (Pell et al. 1997; Torsethaugen et al. 1997; Zheng et al. 2000; Sanmartin et al. 2003). Ozone entered through stomata reacts with apoplastic and symplastic components of the cell (Long and Naidu 2002; Castagna and Ranieri 2009; Cho et al. 2011) resulting in a greater accumulation of ROS, which causes an oxidative damage to the photosynthetic membranes and finally leads to the death of photosynthetic mesophyll cells (Godde and Buchhold 1992; Ciompi et al. 1997; Chen et al. 2005). It was suggested that ozone exposure directly affects guard cells by inhibiting the ion channels (K+1 channel) activity in the guard cell plasma membrane (Torsethaugen et al. 1999). Protection of crop plants from ozone damage could be accomplished by replacement of sensitive biotypes with more tolerant ones as well as by application of synthetic ozone protectants such as ethylene diurea, azoxystrobin, epoxiconazole and penconazole (Blum et al. 2011; Didyk and Blum 2011). However, application of synthetic ozone protectants will pollute the environment and may affect the crop production. Therefore, it is necessary to develop alternative ecofriendly strategies to minimize the ozone damage in plants by using plant-based natural antioxidants such as ascorbic acid. Apoplastic ascorbate is assumed to represent the first line of defence against potentially damaging pollutants (Plöchl et al. 2000; Barnes et al. 2002). Apoplastic ascorbate can protect plants from ozone-induced damage by directly reacting with ozone (Chameides 1989; Plöchl et al. 2000) and ROS (D’Haese et al. 2005) or by serving as a substrate in ROS-scavenging enzymatic reactions (Chen and Gallie 2005). Plant species that are resistant to ozone showed an increased apoplastic ascorbate levels (Lee 1991; Turcsányi et al. 2000; Zheng et al. 2000; Burkey et al. 2006; Feng et al. 2010). Moreover, exogenous application of plants with ascorbate prevented the foliar injury and alleviated the decline in photosynthesis rate caused by ozone stress (Maddison et al. 2002; Zheng et al. 2000). The lower levels of apoplastic ascorbate content greatly enhanced foliage injury upon chronic ozone exposure in tobacco (Sanmartin et al. 2003). Furthermore, Arabidopsis mutants (vtc1) with low foliar content of ascorbate exhibit hypersensitivity to ozone (Conklin and Barth 2004). Similarly, rice TOS17 insertional mutant (ND6172) for a GDP-D-mannose-3’,5’-epimerase gene, which is characterized with 20–30% lower ascorbate level than the wild type, showed a higher level of visible leaf damage upon ozone exposure (Frei et al. 2012). Maintenance of the apoplastic ascorbate redox state is crucial for ozone-induced oxidative stress tolerance of plants and is influenced by activities of enzymes such as AAO and APX. Altered expression of these enzymes was normally observed in plants exposed to ozone (Kubo et al. 1995; Sanmartin et al. 2003; Pignocchi et al. 2006). Transgenic tobacco plants with overexpressing AAO (Sanmartin et al. 2003) or downregulation of cytosolic APX (Orvar and Ellis 1997) resulted in the increased susceptibility of tobacco plants to ozone-induced damage. However, transgenic tobacco plants overproducing chloroplastic APX could not protect from ozone injury (Torsethaugen et al. 1997). The apoplastic ascorbate redox state also depends on the balance between oxidation of ascorbate to DHA in apoplast and reduction of MDA and DHA to ascorbate in cytoplasm. During the detoxification process, DHA produced in the apoplast diffuses into the cytoplasm and recycled back to ascorbate by cytDHAR (via ascorbate-glutathione cycle, Figure 2) on the plasma membrane. The regenerated ascorbate can be transported back into the apoplast for the detoxification of ozone (Luwe et al. 1993; Horemans et al. 2000a; Yoshida et al. 2006). Transgenic tobacco plants overexpressing MDAR gene conferred enhanced tolerance to ozone due to increased recycling of ascorbate from MDA (Eltayeb et al. 2007). Similarly, DHAR-overexpressing plants also showed an increased ozone tolerance with a higher level of photosynthetic activity despite exhibiting a larger stomatal area (Chen and Gallie 2005). In converse, plants with suppressed DHAR activity showed a substantially reduced stomatal area and lower level of photosynthetic activity. Yoshida et al. (2006), demonstrated that Arabidopsis mutant with completely lacking cytDHAR activity showed a significantly lower level of apoplastic ascorbate and was highly sensitive to ozone (Yoshida et al. 2006). Increased level of ascorbate through enhanced ascorbate recycling by DHAR overexpression offered greater protection against oxidative stress despite poor ability to respond to ozone through stomatal closure (Chen and Gallie 2005; Eltayeb et al. 2007). Temperature stress is one of the most important environmental factors affecting the crop yields and geographic distribution of plants. Temperature stresses such as heat, cold or freezing result in excessive ROS production and cause severe damage to cell membranes and proteins (O’Kane et al. 1996; Larkindale and Knight 2002; Suzuki and Mittler 2006; Hu et al. 2008; Yamashita et al. 2008) and also cause impairments in the chloroplast and mitochondrial metabolism (Salvucci and Crafts-Brandner 2004; Vacca et al. 2004; Barra et al. 2005; Nguyen et al. 2009; Barta et al. 2010; Tóth et al. 2011). Several studies demonstrated that ROS-mitigating mechanisms play an important role in protecting crops against extreme temperature stresses (Iba 2002; Yoshimura et al. 2004; Hu et al. 2008). For instance, overexpression of cytosolic APX in transgenic tomato enhances heat and chilling stress tolerance (Wang et al. 2005,2006). Similarly, transgenic potato plants overexpressing APX under the control of an oxidative stress inducible SWPA2 promoter showed increased tolerance to high temperature stress (Tang et al. 2006). In rice, overexpression of OsAPX1 enhanced tolerance to chilling stress at the booting stage (Sato et al. 2011). Increased temperature stress tolerance was also observed in transgenic tobacco plants overexpressing the thylakoid-bound APX gene from tomato. These transgenic tobacco lines, under stress condition, showed a higher APX activity and contained less hydrogen peroxide and malondialdehyde than wild-type plants (Sun et al. 2010b). Moreover, under chilling and heat stresses, the photochemical efficiency of PSII in the transgenic lines was distinctly higher than that of wild-type plants. Wang et al. (2011), reported the similar results in transgenic tobacco plants overproducing ascorbate through the expression of tomato GMPase and observed the reduced ROS activity in the transgenic plants under high or low temperature stress conditions. L-ascorbate may also act as an alternative electron donor of PSII; in those cases electron transfer is inhibited due to inactivation of oxygen evolving complex (OEC) (Mano et al. 2004; Guiss´e et al. 1995; Strasser 1997; Tóth et al. 2009; Gururani et al. 2012). Heat-induced inactivation of PSII was strongly influenced by the ascorbate content of leaves (Tóth et al. 2011). Tóth et al. (2011), experimentally proved the physiological role of ascorbate as alternative PSII electron donor in heat-stressed leaves with inactive OEC. This result suggests that the role of ascorbate as an alternative PSII electron donor is to decelerate the processes of photoinactivation and minimize the ROS activity in the photosynthetic thylakoid membranes, and thus minimize the damage to the entire photosynthetic apparatus. In higher plants, ascorbate biosynthesis occurs through D-mannose/L-galactose pathway, which is a most important source of ascorbate. Ascorbate plays a major role in cellular ROS-scavenging activity. It also influences many stress responsive enzyme activities through synergic action with the other antioxidants such as glutathione and α-tocopherol and reduces the oxidative damage to cells. Recent studies suggest its role in photosynthesis as an alternative electron donor to PSII under abiotic stress conditions and play a major role in protection of photosynthetic apparatus in chloroplast by keeping the ROS activity under check. Several ascorbate biosynthetic pathway transgenes have been introduced into plants through genetic engineering to elevate the ascorbate level. These transgenic plants also provided better stress tolerance to various abiotic stresses such as high light, low/high temperature, ozone, salinity and drought. The role of ascorbate goes beyond that of simply an antioxidant given its apparent involvement in a complex signalling pathway that mediates responses to biotic and abiotic stresses as it is a cofactor for plant hormones such as ABA, GA and ethylene (Conklin and Barth 2004). However, role of ascorbate in signal transduction needs to be clarified further, particularly with respect to drought tolerance provided by altered stomatal movements. This paper resulted from the Konkuk University research support program. JV surveyed the literature and drafted the manuscript. PSW provided guidelines for the review, modified and prepared the final version of the manuscript. All authors read and approved the final manuscript.